It’s happening. Here you are, yet again, staring at all of your hopes and desires on a computer screen, hoping the auction price stays stagnant just like your car collection seems to. A clean, sparkling, low-mileage 1994 Toyota Supra Turbo is on the virtual block at Bring a Trailer, and this is finally your moment. That is, if the price doesn’t go any higher. The bid, as of this writing at $38,000, is already near your breaking point, and there are six days left in the auction. You fondly remember the love you had for the one listed in April that had less than 6,000 miles on it, but that ended in heartbreak as well when it sold for $80,500 and then sold again. Do none of these bidders have expenses? Retirement to consider? College funds to save for? Cats who need cute but expensive new Halloween costumes? You recognize that this car will go more or less in the same direction as every other clean fourth-generation Toyota Supra does, with its six-speed manual transmission, low mileage, manuals from the factory, window sticker, pristine appearance, and, of course, “Supra” scribbled over its iconic taillights. You know it’ll be expensive when it finally does auction, but you keep holding out until it’s too expensive for you. It makes things easier that way. You tried. 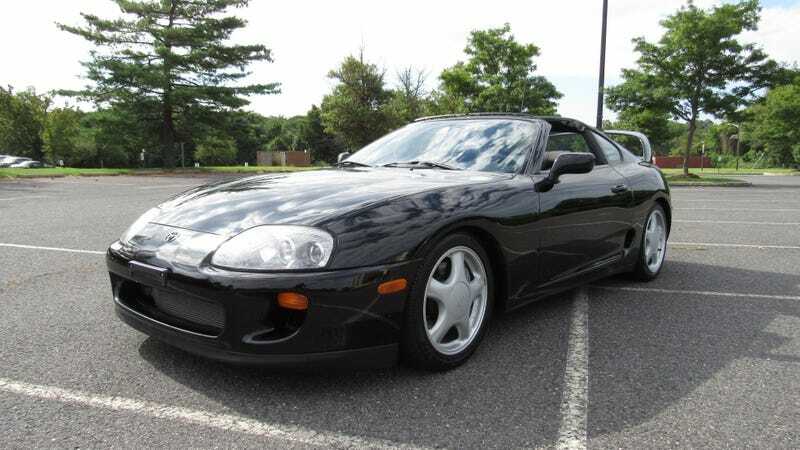 Because it’s only Tuesday and this listing has six days left, you’ll be staring at this Supra all week at work. You’ll have it open in a tab next to whatever you’re supposed to be doing but aren’t, clicking it compulsively every seven and a half minutes to reload the page and see if anyone’s driven the price up yet. With the auction history on the website, all hope isn’t lost yet. Then, one afternoon, it’ll shoot from the “Eh, I could still manage that” range to a shocking, horror-inducing price figure that shatters all of the hopes you warned yourself not to have in the first place. You’ll close the tab, stand up to walk it off, and run into a coworker who asks you what you look so sad about. “Oh, just this car that starred in a movie in the 2000s that I’m obsessed with but will never be able to afford,” you say, because that’s the easiest way to describe it, as they toss you a funny look and try to console you while walking away because they don’t have much to add. You get back to your desk, put in your headphones and bring up your Katy Perry playlist, knowing you’re not supposed to listen to music at work but also that this is a hard moment for you and you need to acknowledge your feelings. “October 2018: 1994 Toyota Supra Turbo, 20,422 miles,” you scribble down in your notebook, hoping that one day, when an MKIV Supra is in your driveway instead of on your computer screen, you’ll be able to show everyone who asks about the car your inspiring list of all of the ones that got away. Then, you’ll finally be able to delete that Katy Perry song from your library.